You'll find us warm, welcoming and friendly. We will tailor our service to your needs. 4* comfort at 3 star prices. You wont find us cheaper on any other website - Guaranteed! Introducing QFriends, a generously rewarding loyalty scheme. Plus get a joining bonus. Welcome to the Queensgate Hotel, where we pride ourselves on exceeding expectations and delivering a 5* service at a 3* rate. We offer a range of room types to suit everyone’s requirements and budget. Whether you’re a lone traveler on a budget, a couple on a special weekend stay away, a family enjoying some family quality time or a business executive looking for superb facilities at affordable prices. You’ll be sure to find the right room for you. The hotel boasts something for everyone. Our sports bar is where those sport mad fans congregate to discuss the latest transfer news and comment on the live games being shown. The ladies, on the other hand, can go and be pampered at our Beauty and Wellness spa in the peace and tranquility, leaving their stress and worries at the door. Then, enjoy the evening together in our Mediterranean themed Sweet Olives restaurant where outstanding, fresh, local food is served at unbelievable prices. 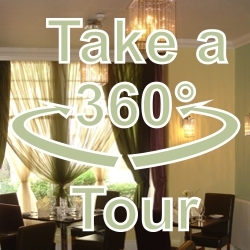 Whether you choose to cosy up with a class of wine in our lounge, sharing memories and stories, or go out and experience the local nightlife in Peterborough, our staff would be more than happy to recommend places in the area. If you’re planning a night out, let us call you a taxi, or if you’re looking a quiet night in front of the television, let our room service bring your dinner to you. Whatever your reason for staying, at the end of a busy day, we guarantee a comfortable bed for a good night’s sleep. Book Direct – Enjoy the best deal and some special perks! Double loyalty points on your first stay – we have one the most generous loyalty schemes anywhere. Points are exchangeable for valuable well known brands of drinks, jewellery, bicycles and many household and leisure items. Guaranteed value – book with confidence. You won’t find us cheaper anywhere else. If within 48 hours booking, you find the same room for the same day cheaper on any other web site (no matter what their buying power!) we will refund you double the difference. In the heart of East England, 10 Minutes walk from the city the center and only an hours drive from Central London. Our well equipped en-suite rooms are amongst the most spacious you will find anywhere, For the discerning traveller, our executive rooms include extra special details to enhance your stay including complimentary slippers, fruit, mineral water, espresso machines and even free direct dial UK calls also, of course, high speed internet. Even our standard rooms cheaper than many ‘lodge’ or ‘inn’ rooms with all the facilities of a full service hotel. All have well presented ensuites and tea and coffee making facilities. You’ll find staying with us an altogether friendlier experience with staff trying their utmost make your stay personable. 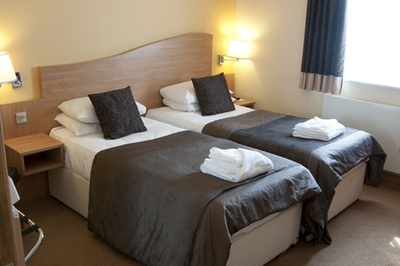 The Queensgate Hotel gives you 4 Star comfort at three star prices. What is more we guarantee that you will not find our rooms being sold cheaper on any other website. That’s guaranteed – or we’ll refund double the difference! Your stay comes with a high quality wifi access that is genuinely free. We won’t restrict your access or the time you are allocated (unlike others!). You’ll get all the extras that a full service hotel usually offers including in-room dining, choice of food, be it our bar menu or the branded Sweet Olives restaurant. For the discerning traveller, our executive rooms include extra special details to enhance your stay including complimentary slippers, fruit, mineral water, espresso machines and even free direct dial UK calls also, of course, high speed internet. The Executive rooms include a bluetooth radio and our Luxury room includes a complimentary massage or float in Beauty & Wellness (subject to availability) They also have flat screen digital televisions, wired internet, well appointed en-suites and our famous freshly cooked breakfast is included in the rate. At The Queensgate Hotel, we all appreciate you staying with us. This comes through the accolades our staff earn from guest reviews for our total service orientation and making your stay as trouble free as it could be. Our rewards scheme, QFriends genuinely rewards loyalty. The points you earn can be applied to some of the best branded goods on the high street and some top experiences. The Queensgate Hotel has a very limited number of rooms suited to the longer duration stays at budget prices. Please enquire about current availability.